Enhancing Your Winery Experience This app was developed by Osprey Ridge Vineyards, a family owned and operated farm. Our family has been leaving our footprints in the terroir of British Columbia since 1926. We are now in our fourth generation and the fifth is on the way. We developed these apps to help you with every part of your winery experience as if we were there with you every step of the way. Browse through the list of wineries and learn about what each has to offer. If you are planning a wine tour, let the app take care of the work for you. It will navigate a route to any winery you choose and includes wineries that are hidden away and most people miss. Your new companion will help you select tastings and special events and even notify the winery that you are attending. While you are on your tour this app will allow you to document your experience and shared it with others in your group and on social media. In the Wine Cellar, you can house your favorite wines and make detailed notes, ratings and keep pictures of the bottle to help you find it again long after the tour has ended. Pick a spot on the map or use your location to see all the wineries near as you travel. Who knows what hidden gem you will discover. We hope this app can enhance your visit to our area so you can enjoy it as much as our family does. Check these links to find your download for Wineries of British Columbia for & iOS or for your device iPod TouchiPadiPhone. 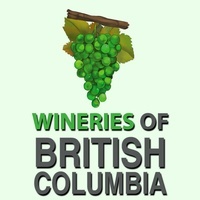 The app Wineries of British Columbia is compatible with te following devices.